Marinate the chicken pieces with all the ingredients listed under 'For marinating chicken'. Let it stand for 30 minutes. Add boiling water, salt and lime juice. Cover and cook on low flame till the water is dried completely and the rice is cooked. Heat ghee and oil in a pan, sauté onion till it becomes golden. Add ginger, garlic and green chilli, cook for few minutes. Add chilli powder, coriander powder and garam masala along with little water and sauté till oil separates. Add tomato, coriander leaf, mint leaf and chicken, stir for few minutes. Add required amount of water and cook till the chicken is almost done. Finally, add cashew nut paste and cook till the chicken is done and the gravy is thick. Heat oil in a pan, add sliced onion and fry till golden brown. Drain it on a paper towel. Heat ghee in a pan, fry the cashews and raisins, keep aside. Soak the saffron strands in rose water and pineapple essence, keep aside. Pre-heat the oven to 180°C for 10 minutes. Grease an oven proof dish with some ghee and spread chicken masala. Sprinkle some fried onion, coriander leaves, mint leaves, cashew nuts, raisins and saffron mix. Spread cooked rice and cover the baking dish with aluminium foil. Bake for 15 minutes. 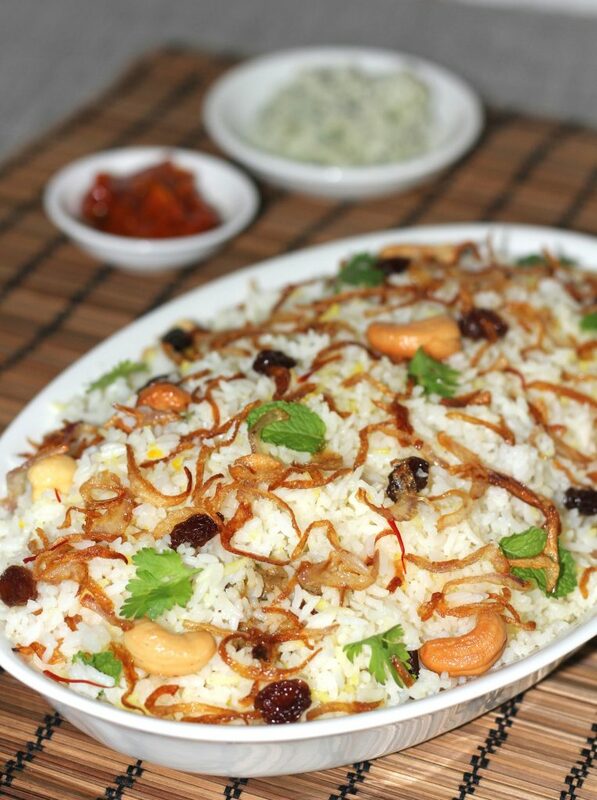 Garnish the baked Biriyani with remaining fried onion, coriander leaves, mint leaves, cashew nuts, raisins and saffron mix. Serve hot with pickle, raita, chutney and pappad.